Fans of Movado creations are never disappointed with the designs that are presented. 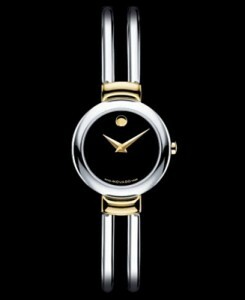 We love Movado, because of their style, their quality, and their consistency. They continually produce beautiful watches, all with a distinct and recognizable look. The Swiss watchmaker has made a point of never loosing site of fashion, when creating these high quality pieces. Neither the form or function are in competition with one another…instead they work together, like voice and instrument. This melodious joining is ever-present in the, appropriately named, Harmony collection. The Harmony Women’s Watch is a lovely and delicate design. The watch is a bangle style, crafted of solid stainless-steel. 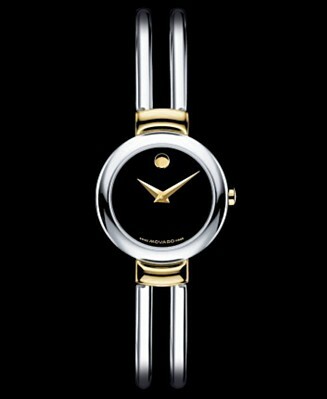 The model number 606056 is classic Movado. The black Museum dial is the prominent feature of this timepiece, and it is tastefully adorned by the singular Movado dot. The clean look of the face is complimented by a streamline double bangle bracelet, in polished stainless-steel. The bracelet is crafted with a jeweler’s clasp, and adjustable settings. This is a Swiss Quartz movement, and is water resistant to 3 ATM. The Harmony collection comes in different variations, from full steel, to steel and gold tone, to solid gold tone. All subtle, all striking, and all Movado. They hit the perfect note!